That's right. New year, new chapter! I hope you'll join me at my new (very own space!) on the web. I've moved all the recipes from this site to the new one, so you have nothing to worry about. Promise. I couldn't more excited (or freaked, let's be honest here) about taking this step. But I love challenges and taking opportunities that will help me grow. So stop by my new site and stay awhile! 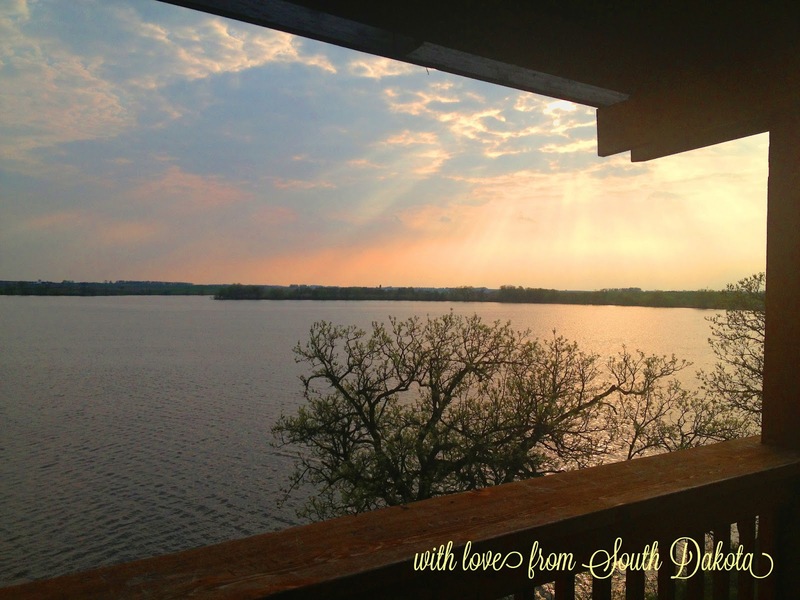 I can't thank you enough for supporting With Love from South Dakota, my first blog baby. You are shaking your head, aren’t you? You know I had to, given the ingredients for these scones. Here I am with another holiday-spice-and-citrus combination, and it’s a winner. 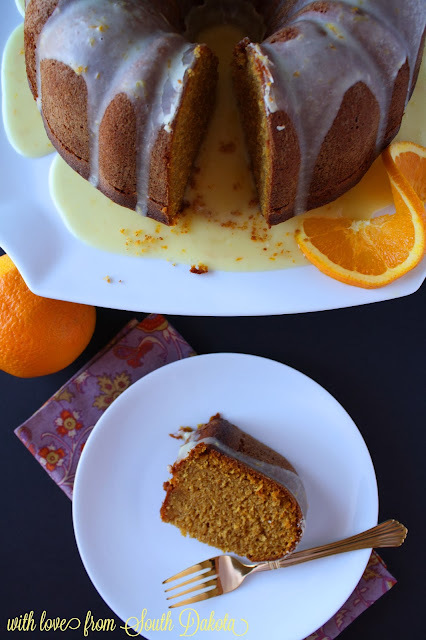 In case you missed my last post, go read all about my Orange Pumpkin Holiday Cake. Scones are the perfect example for why you should never judge a book by its cover. You should never judge a scone by its appearance. I am a big enough girl to admit it took me 28-and-a-half years (yes, just 3 months ago) to try a scone. You are shaking your head again, aren’t you? I couldn’t get over the fact they look like big ol’ dense bricks of dough. I had a dear friend tell me she prefers scones to doughnuts. I love me some doughnuts, but I trusted her judgment. She’s got experience in the Pillsbury and Betty Crocker test kitchens, so yeah, she knows what she’s talking about. So I jumped on the Scones Train and now I’m pretty much obsessed with them. These Gingerbread Scones with Tart Lemon Glaze are incredible. Full of ginger, cinnamon, cloves, and molasses, they taste like Christmas. They are incredibly moist inside, but they have a good crust—you know like the kind banana bread fresh from the oven has. For this recipe, I used full flavor molasses, but you can certainly substitute your molasses preference. I decided to use dark brown sugar to bring more depth in the flavor of the scones. If you don’t have dark brown sugar on hand, light brown sugar will be just fine. The original recipe stated to use a food processor to blend all the ingredients. Although purchasing a food processor was one of the best buys for me ever, I decided to mix everything up the old-fashioned way. I used a pastry blender to work in the butter, and after adding the milk and molasses, I used a spoonula (spatula + spoon) to finish blending the ingredients. This process worked well for me. My arm was slightly tired, but I knew that burning those extra calories are a good thing when it comes to making scones. After the ingredients were well incorporated, I shaped the dough into a disk about 8 inches wide and about an inch thick. I dusted both sides with a little flour, and I cut the dough into 8 wedges. I transferred the wedges to a parchment-baking sheet about 1.5 inches apart. Here’s where the best scone-making secret I’ve ever learned, thanks to King Arthur Flour, comes in handy: place the pan, uncovered, in the freezer for 30 minutes. Why? So that you have more tender scones that rise higher, the freezer relaxes the gluten. Who doesn’t love thick, crumbly and flaky scones? As for the glaze, it’s perfectly tart. My husband, who is not a lemon fan (but he wants you to know he does like lemonade), thought the glaze on the scones was a great addition. 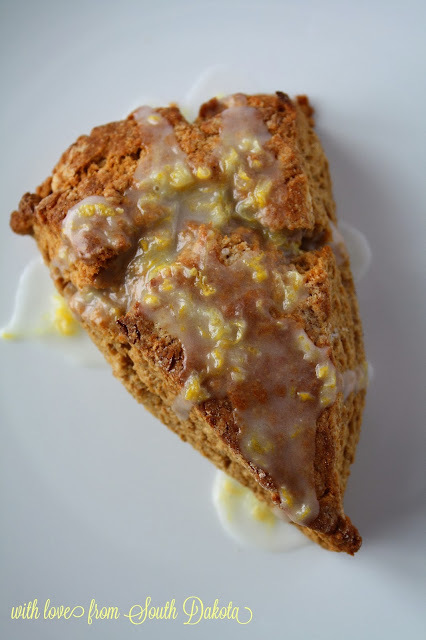 His take is that these scones are on the sweeter side, so the tart lemon glaze balances their sweetness. I like the lemon glaze because it’s fresh tasting, almost like bottled-up sunshine. 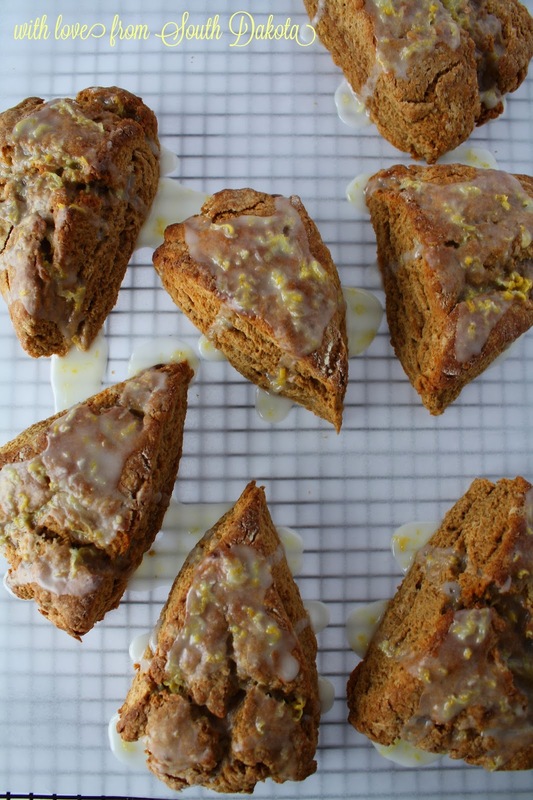 I just adore these scones, and I hope you do, too. Just a note from experience: you will like that I am sharing the hand-mixing method. 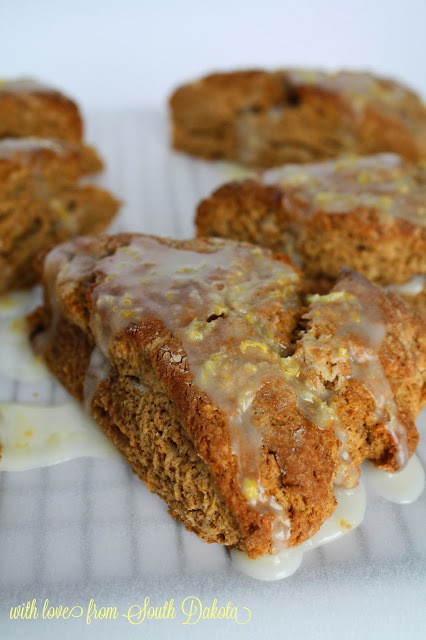 That way when you’re reaching for your second scone and humming “Oops, I did it again…” you won’t feel so bad. In a medium-sized mixing bowl, combine flour, brown sugar, ginger, baking powder, cinnamon, cloves, baking soda, and salt. Add butter, and blend in using a pastry blender until the pieces of butter are slightly larger than pea-sized. Whisk the buttermilk and molasses together in a small measuring cup, then add to the mixing bowl. Shape the dough into a disk that is 8 inches in diameter and is 1 inch thick. Lightly cover the dough with flour. Using a sharp knife, cut the dough like a pizza into 8 wedges. Transfers the wedges to a parchment-lined baking sheet leaving 1.5 inches of space between them. Place the baking sheet in the freezer, uncovered, for 30 minutes. Preheat the oven to 425F degrees. 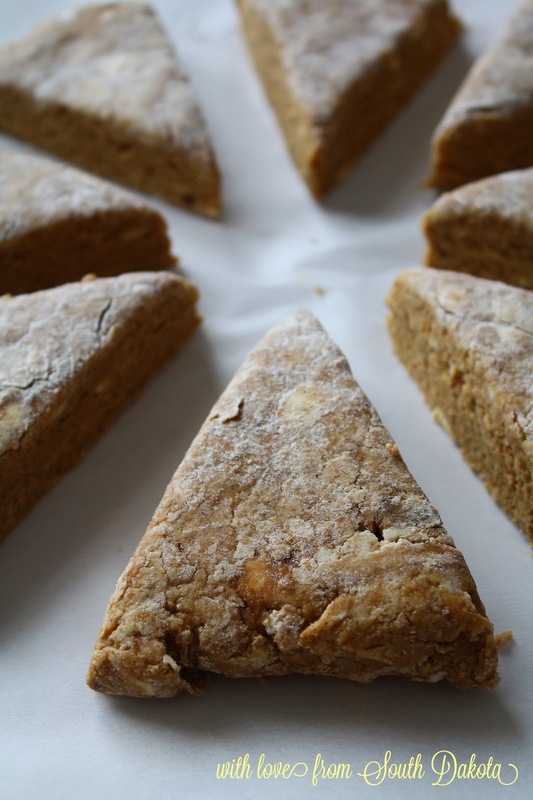 Bake scones for 15-16 minutes, until they are nicely browned and firm to the touch. Remove from the oven and transfer the scones to a wire rack to cool. To make the glaze, combine powdered sugar, lemon juice, lemon zest and milk in a small bowl. Whisk the ingredients together until well combined. 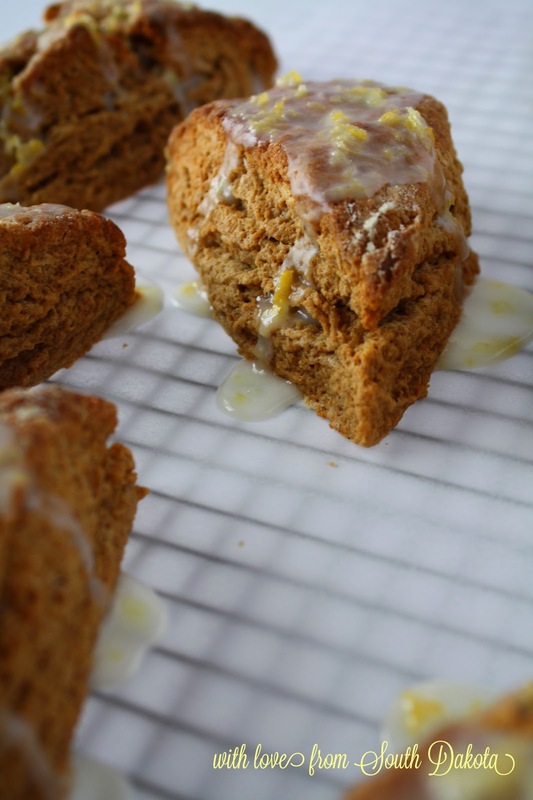 Drizzle glaze evenly over warm or cooled scones. Keep cooled scones in an air-tight container up to 3 days. So I just did something pretty incredible. I made a cake that celebrates two holidays and two seasons. 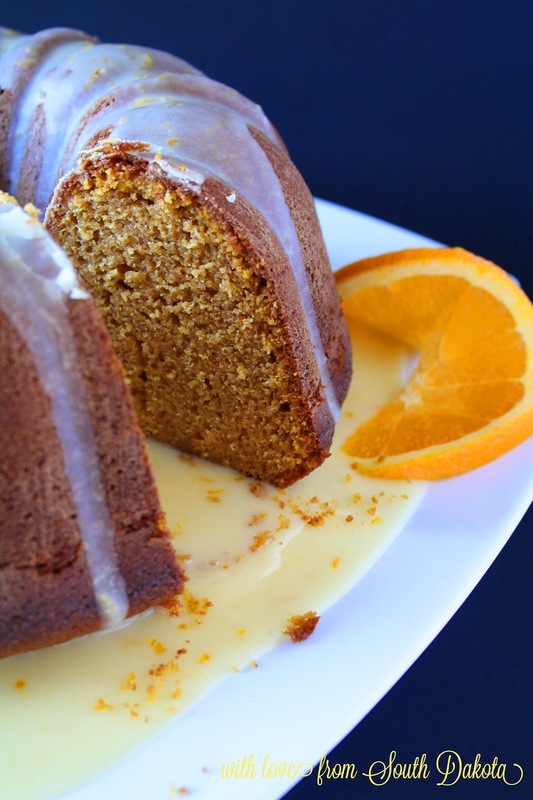 This Orange Pumpkin Holiday Cake is a show-stopper. It’s unbelievably pretty, and it’s unbelievably festive. Pretty festive? Pretty festive it is. When I think of fall and Thanksgiving, I think of pumpkin. Pumpkin pie is always on the Thanksgiving table wherever my family is celebrating. Leading up to Thanksgiving, I feed my pumpkin addiction with appropriately flavored lattes, Hershey’s Kisses, scones, baked oatmeal...yeah, I kinda have a thing for pumpkin. When I think of winter and Christmas, I think of oranges. Orange and cranberry is a great holiday combo. And when I was a little girl, the men’s group at my church would hand out candy bags to the children after the Sunday School Christmas program every year. Besides red hot gummy bears and peanuts in the shell, I could always count on an orange in my bag. When I came across this recipe in a cookbook my mother-in-law had gifted me a long (LONG!) time ago, I knew I had to make it. Although I have a bundt cake pan, I’ve actually never made a cake in it all the years I’ve had it. Monkey bread? Definitely. Cake? Nope. I knew it was time to change that. The flavor combination of orange and pumpkin was a new one for me. And I love unique flavor pairings. Potato chips + milk chocolate. Gouda cheese + dark chocolate. (Okay, so I have a thing for chocolate.) Beef sirloin + ground espresso. But orange + pumpkin? I was intrigued, so I knew I needed to give this recipe a try. As you can see, this cake is simply gorgeous. But what about the taste? It’s simply delicious, too. 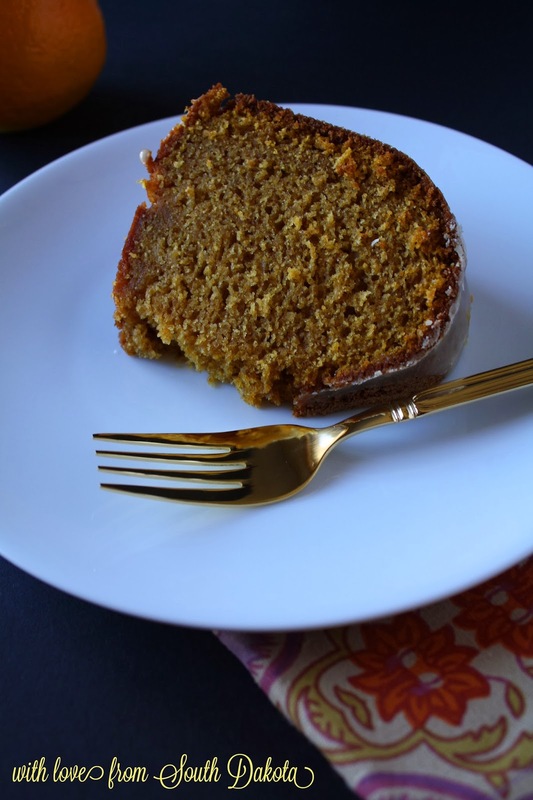 It leans towards the orange flavor—after all it is Orange Pumpkin Holiday Cake—but the pumpkin flavor can definitely be recognized. The spices blend so well with the orange and the pumpkin—so it’s like an equal combination of mulled cider and pumpkin pie...if that makes sense. It probably doesn’t. But maybe it does? This cake is super moist, which is how a cake should be. What this cake also has going for it is that it’s not crumb-y. You know how annoying it is when you cut moist cakes and they practically fall apart because nothing is holding it together? Yeah, you won’t have that problem with this cake because it cuts and serves so nicely. You won’t be able to use the I-need-to-go-back-and-pick-up-the-crumbs-well-hey-I-guess-I’ll-just-have-another-slice-then excuse. I’m telling you now: just plan to have a second slice. The glaze is the perfect addition to this cake. It’s citrusy-sweet, and it’s light. My husband does not like frosting (I know. The horror! ), so a glaze like this is well-received by him. I opted for a thinner glaze because it’s oh-so-fun to watch the glaze ooze down the sides of the cake, but if you prefer a thicker glaze, no problem. You can certainly adjust the milk in the glaze to your liking. One thing I wouldn’t adjust in this recipe is the grated orange peel. There was a time in my life when I thought grated citrus peels were just ways to add more work to a recipe. The flavor pop they provide is so worth the little effort it takes to grate a peel. I think this cake is a beautiful way to celebrate the holidays and the fall and winter seasons. It’s so festive. And so pretty. But it’s definitely not too pretty to eat. Enjoy and Happy Thanksgiving! Preheat oven to 350F degrees. Grease with butter and lightly flour a bundt cake pan. In a large bowl, beat sugar, oil, and eggs with a mixer. Add pumpkin and mix well. In a separate medium-sized bowl, combine flour, baking soda, cinnamon, salt, baking powder, allspice, and cloves. Add the dry ingredients to the creamed pumpkin mixture, alternating with the orange juice concentrate. Add grated orange peel and mix well. Pour batter into prepared bundt cake pan; pan will be nearly full. Bake for 60 to 65 minutes or until inserted toothpick comes out clean. Cool 5 minutes; invert onto a wire rack. 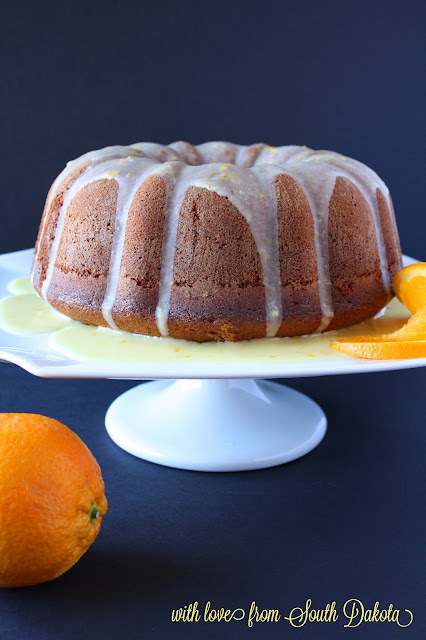 When cooled completely, spoon orange glaze over cake. Serves 16-20. In a medium-sized bowl, whisk the powdered sugar, orange peel, orange juice concentrate, and milk until fully incorporated. Spoon glaze over cooled cake. 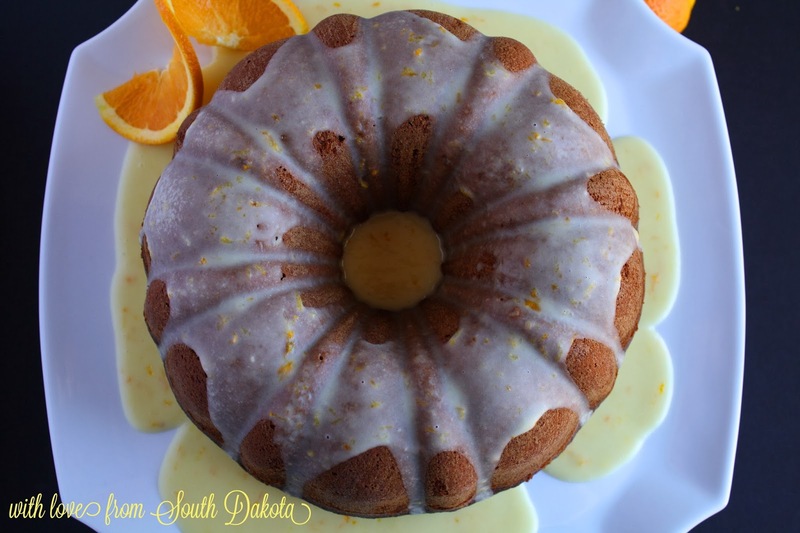 Recipe adapted from Kristi K., originally found in the Immanuel Lutheran Ladies Aid and LWML 75th Anniversary Cookbook, Nebraska. You know those popcorn tins that pop up (pun totally intended) in stores this time of year? Yeah, I love them. You know those popcorn tins that have the trio of flavors—butter, cheese, and caramel? I always go for the cheese first. I don’t care if it gives me orange fingers. Then I go for the butter. THEN I go for the caramel. I’ve just never really been a caramel corn fan. Maybe it’s because the caramel corn in those tins almost tastes bitter? Too syrupy? Am I the only one that thinks this? But let me tell you. If those holiday tins included this Turtle Popcorn, I’d be all over it. Sorry, cheese and butter. It’s not you, it’s me. Well, it’s actually that this Turtle Popcorn is irresistible in all sorts of ways. It starts with stove-top popcorn. That’s right. I went all old-fashioned, and I made popcorn on the stove for the first time ever. And I’m hooked. It’s so fun. It’s so delicious. And it’s so easy! I decided to keep it local, and I used Lakota Popcorn, which is popcorn grown and harvested by the Lower Brule tribe of South Dakota. Love it. With stove-top pop, the key is making sure the oil is hot before the kernels are placed in the pot with it. One kernel of popcorn should be placed in a large pot with the oil. Once the kernel pops, it means the oil is hot and the rest of the kernels can be added. It’s important that there is enough room in the pot so each kernel touches the bottom of the pot. Once the kernels are thrown in, cover the pot with a lid. While seeing the lid stays on, slightly shake the pot to promote popping and to prevent burning. Before you know it, you’ll have a huge pot of popcorn. What I love about this popcorn is the buttery, sweet, and salty caramel coating. Despite ingredients that you’d think would make the caramel heavy (like brown sugar, butter, and corn syrup), it’s anything but heavy. In a weird way, the caramel is kind of light, so you’ll keep eating and eating Turtle Popcorn before realizing the damage done. I totally speak from experience. 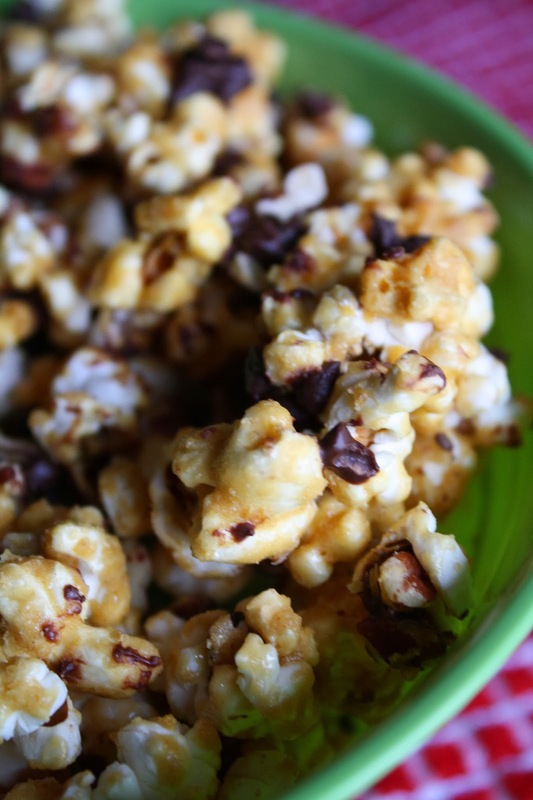 The caramel-y popcorn is tossed with pecan pieces and it is baked in a low oven. Every so often, the popcorn is stirred—or rather scooped and redistributed on a large jelly roll pan. Mini chocolate chips are thrown in at the end. I decided to throw half the chocolate chips during the last 15 minutes of baking, and I sprinkled the remaining half once the popcorn was out of the oven. I like my chips a little melty, but it’s up to you. This Turtle Popcorn is so addictive. The salty and sweet caramel combined with chocolate and the nutty texture of the pecans is definitely a winner. What I love about this recipe is that it makes a big ol’ bowl full. I’ve got just the idea: you could totally make your own holiday popcorn tins this year. Your family, friends, and neighbors would love you for it. In a large, covered pot, heat the oil and 1 kernel of popcorn. After the kernel pops, pour in 2/3 cup popcorn and recover. Shake the pot frequently until all the corn in popped. Remove all loose kernels. Preheat oven to 250F degrees. In a medium saucepan, bring to boil brown sugar, butter, corn syrup, sea salt, and cream of tartar. Boil for 5 minutes, stirring frequently. Remove from heat and add vanilla extract and baking soda. 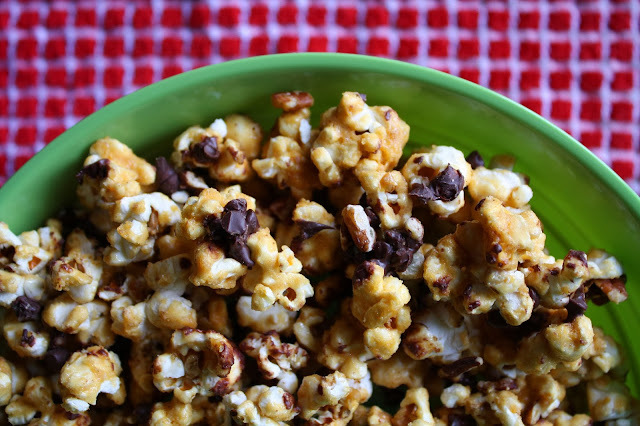 Drizzle half of caramel over the popcorn and sprinkle with 1/2 cup pecan pieces. Using a spatula or wooden spoon, stir the popcorn well. Drizzle the remaining caramel over the popcorn and sprinkle the remaining pecans, and stir the popcorn well. 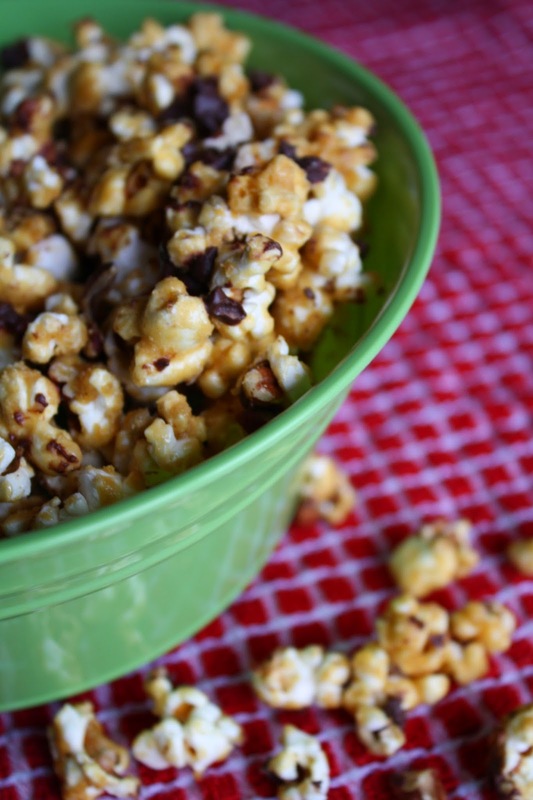 Pour popcorn onto a parchment-paper-lined jelly roll pan and spread out popcorn. Bake for one hour, stirring (or rather scooping and re-spreading out) popcorn every 15 minutes. 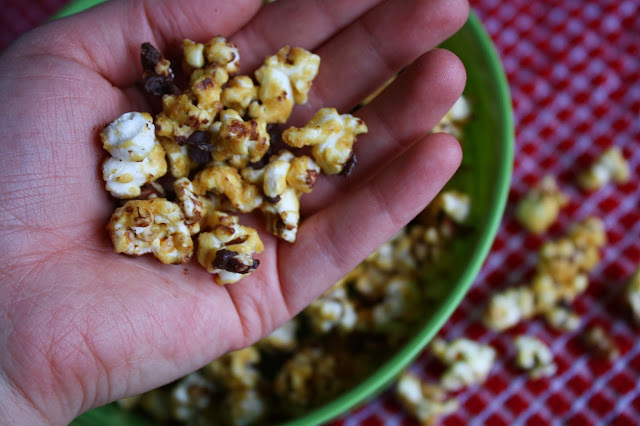 Chocolate chips can be sprinkled over popcorn during the last 15 minutes of baking or once out of the oven. Spread onto parchment paper on counter to cool. Makes approximately 4 quarts of popcorn. Recipe adapted from Patty B., Norfolk Unit 16), and Jean B., Cook Unit 360, originally found in the Cooking with Pride cookbook by the American Legion Auxiliary Department of Nebraska 2010. I'm baaaaaaack! In case you didn't notice, I took a break. A long break. My last post was in May. And it's November. What's up with that? For starters. After a looooooong winter, South Dakota thawed out. Less time indoors meant less time on the computer, reading blogs, and creating blog posts. But don't worry. I still cooked for my family, and they have been well-fed the past six months. Second on the list: I decided to participate in my local library's adult summer reading challenge. I read 20 (yes, twenty!) novels between June 1 and August 31. More time with my nose in a book meant less time on the computer, reading blogs, and creating blog posts. Before this summer, I can't remember the last time I read a book. Blogs, online articles, and magazines are usually my go-tos. Finally. In August, I welcomed the opportunity to become a working-full-time-outside-the-home mom again. I love what I do (I develop educational resources for two entomologists. I know more about insects than I ever thought I would! ); my supervisors are great people; the boys love daycare; and the family has adjusted to a new schedule. Less downtime during the day (i.e. nap time for the boys) meant less time on the computer, reading blogs...you get the idea. I’ve figured out how to balance my and my family’s schedules (for now), so I’m back to blogging. Yay! But enough about me. 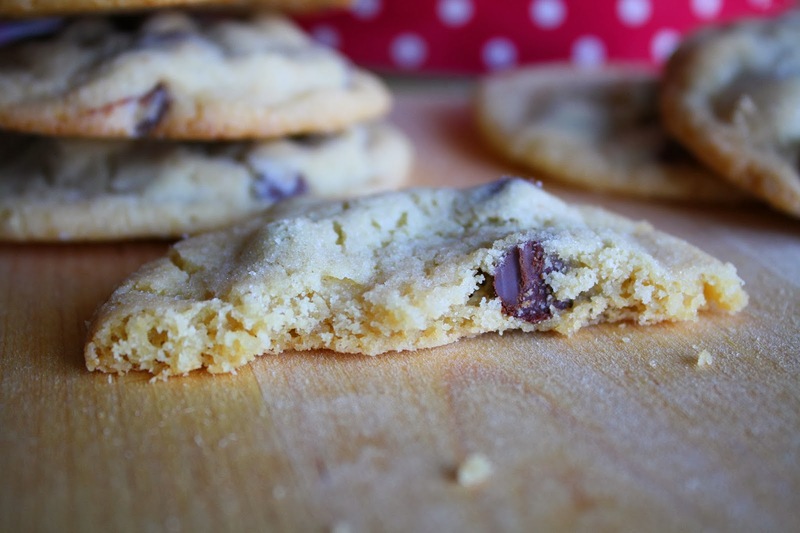 I want to talk about these Sugary Chocolate Chip Cookies. For the record, I think it’s a-ok to start baking for the holidays. It’s a wonderful way to spread some cheer, especially if you share your treats with others. That is, if you’re the sharing type of person. I usually am. These chocolate chip cookies are extra-special: before they are baked the dough is formed into a ball and then rolled in sugar. Sparkling, pretty sugar. I mean look at how sparkling and pretty these cookies are. 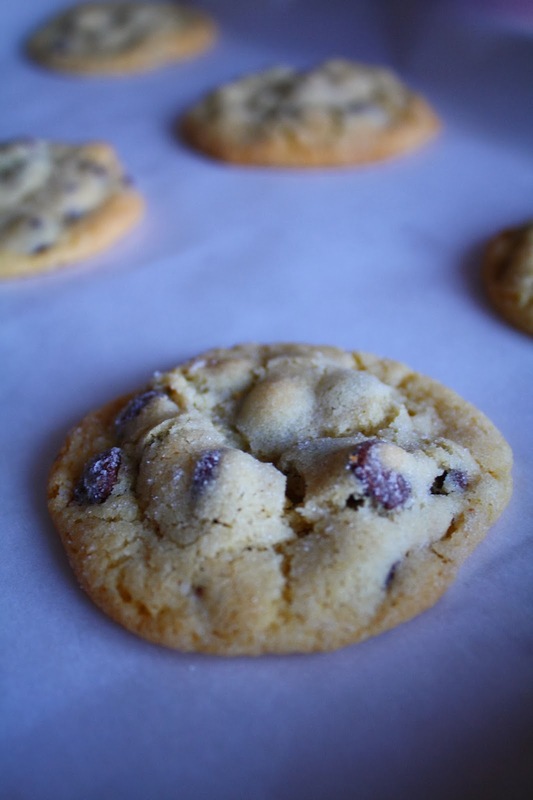 Not only are these cookies pretty, but they are what chocolate chip cookies should be. They are soft and buttery—to the point of nearly melting in your mouth—and they are jam-packed with chocolate chips. What’s a chocolate chip cookie without chocolate chips? The sugary coating adds a slight crunch (I’m talking slightest of the slight) that’s unexpected but adds to the overall texture of the cookies. 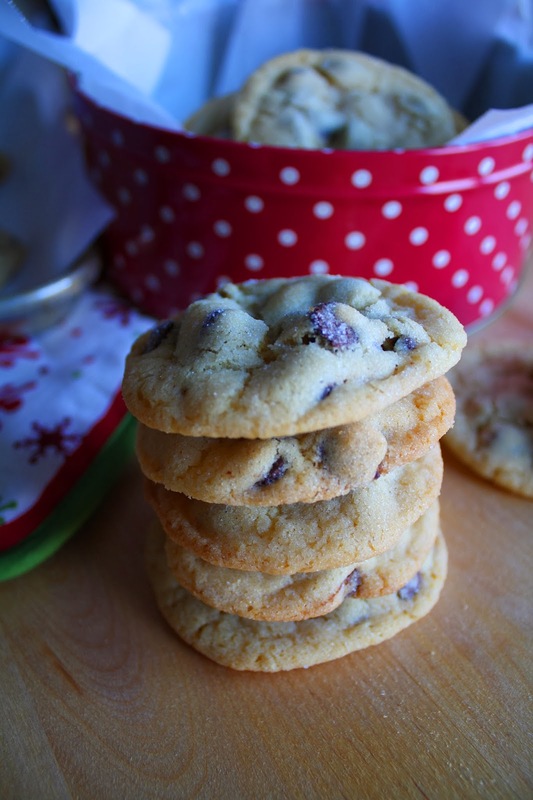 I love how simple these cookies are to make, and they do not take much longer to prepare than regular CCCs. Garrison, my oldest helped me used a cookie scoop to form the balls, and he had the best time shaping them and rolling them in the sugar. The process is basically a 4-year-old’s dream. And these cookies are basically my dream, too. Make them, and share them. Or not. It’s totally up to you! Preheat oven to 350F degrees. In a mixing bowl with a paddle attachment, combine butter, brown sugar, granulated sugar, and vanilla. Beat at medium speed until well-blended. Beat eg into creamed mixture. In a medium-sized bowl, combine flour, baking soda, cream of tartar, and salt. Pour into creamed mixture, and let it beat just until blended. Stir in chocolate chips with a spatula. Using a small cookie scoop, scoop dough. Form balls with the dough by rolling with the hands; dip and roll the balls into the small bowl of granulated sugar. Place dough balls on parchment-paper-lined cookie sheets 3 inches apart. Lightly press each ball with the palm of the hand; do not flatten the dough balls. 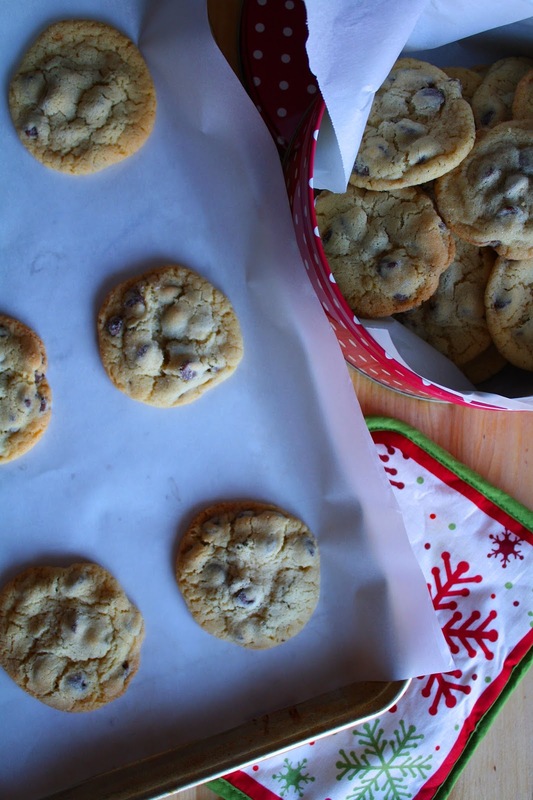 Bake one cookie sheet at a time 8-10 minutes. Let cookies sit on cookie sheet 2-3 minutes after baking. Place cookies on cooling racks. They will be soft. Makes approximately 2-1/2 dozen cookies. Ummmm, it’s the end of May. How did this happen? It’s been nearly a month since my last blog post. A MONTH! I didn’t intend to take a break, but May happened, that’s what. My beautiful state decided it would thaw out this month. It was a loooooong winter. I bet you can agree if you’ve been following my posts and listening to (or is it reading about?) me gripe about it. But I survived my first South Dakota winter! I scooped boat loads of snow. I rocked a down, to-the-calf-length coat with a fur-lined hood on a daily basis. I endured frozen nose hairs walking through the grocery store parking lot. And I lived to tell the tale. So what has May been like? 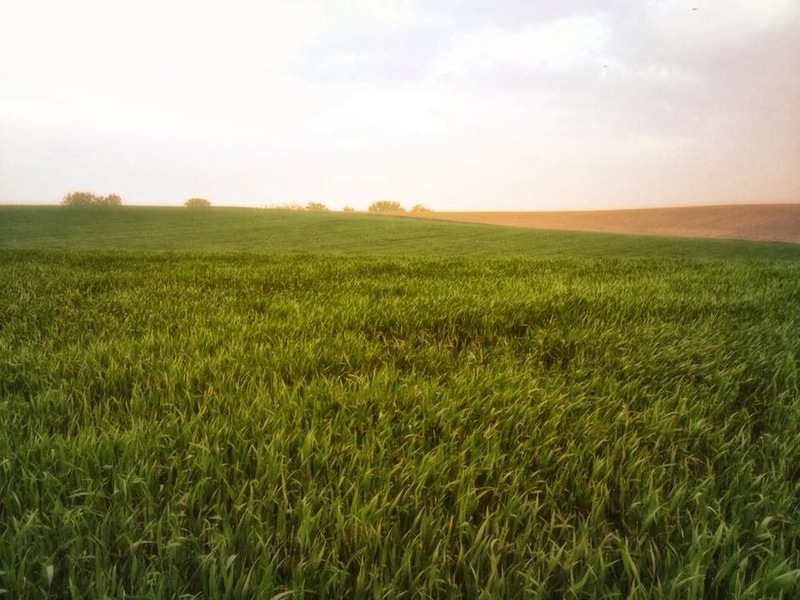 I can see my grass, my beautiful green grass. My neighborhood trees are covered with pink and white blossoms. Grape hyacinths and tulips are blooming everywhere. The sun rises before 6:00 and sets after 9:00, which means long, glorious days. Temperatures are perfect. My biggest dilemma is deciding whether or not to wear a sweatshirt on our evening walk. I know. Life problems. So what has my family been up to? This month we traveled to Nebraska twice. The first visit was for a high school graduation. I used to babysit the graduate, and her family is great friends of my family. I seriously can’t believe I’m old enough that kids I babysat are now adults. So weird. And if that’s not weird enough, the second trip to Nebraska was spent reconnecting with my old classmates at our 10-year reunion. We met at a townie bar in our county, and I had so much fun. And yes, we did talk about how impossible it seemed that 10 years has passed since receiving our diplomas from good ol’ Fillmore Central High School. 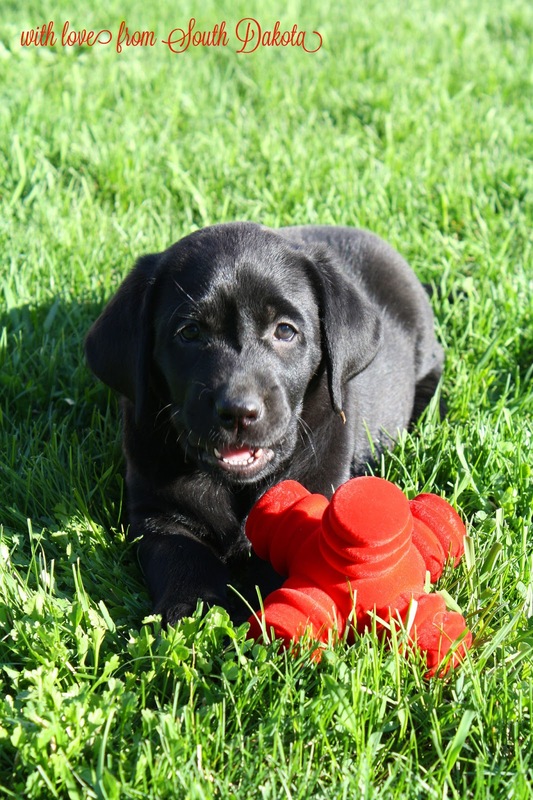 On Mother’s Day, we welcomed a black lab puppy, Ruby Mae, to the family. Ruby is a great addition; we all love her. She is growing before our eyes, and the boys are learning to deal with a rapidly changing puppy. She enjoys running with (chasing now) Garrison, and she and Kase share an interest in sidewalk chalk, although I’m certain for different reasons. We are so thankful she is a well-behaved puppy. She still has her puppy-ness, but overall she is a calm girl who loves a good belly rub and wants nothing more than to sit on your feet/lap/wherever on your body she can. She’s going to be a great family dog. Now that’s it finally spring, we have enjoyed many outings to our neighborhood parks. We have visited a local lake and had a picnic. So pretty. We have explored our town’s walking trails. They are perfect for a little boy who now has a big-boy bike and wants to practice his new skills. But enough about us. How about this pizza? You already know about my family’s love of pizza. I’ve had this Breakfast Pizza in my blog-pocket for some time now, and it would be selfish not to share it. This pizza has amazing flavor. 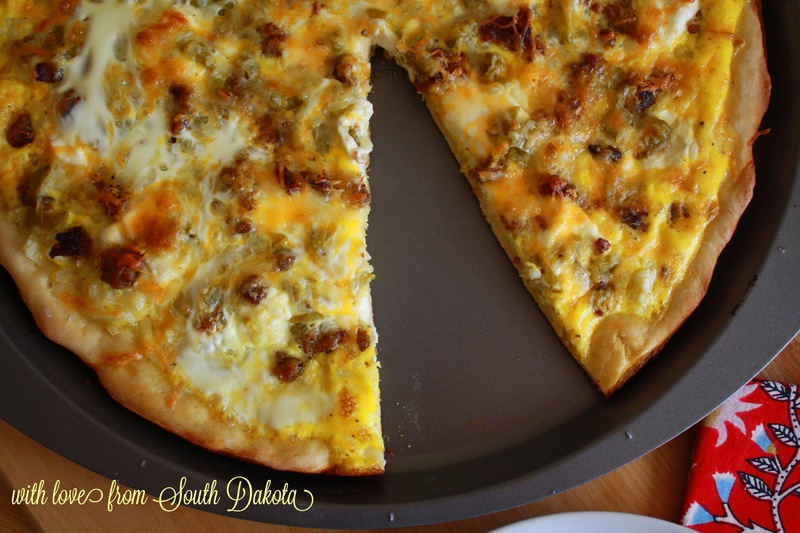 Between the sausage, green chiles and cream cheese, it’s simply irresistible. So irresistible that we can polish off this bad boy in one sitting. And I’m not ashamed to admit it. And know that I won’t judge you if you do the same. My favorite sausage, medium-spiced ground pork sausage, is sold by the pound. What I like to do is fry all the sausage, just as I cook ground beef, and drain the excess grease. I freeze half the sausage, and I use the other (warm) half for the pizza. The next time I get a craving for this pizza, all I need to do is thaw the sausage. So easy, and it is definitely a time-saving method. I will try to post regularly again. I’ve been cooking and baking some great things, and I need to share them with you. I also have an idea for a blogging series that is just too fun and so me. I can’t wait to tell you all about it. Stay tuned! Preheat oven to 375F degrees. In a large pan, cook the sausage and drain. 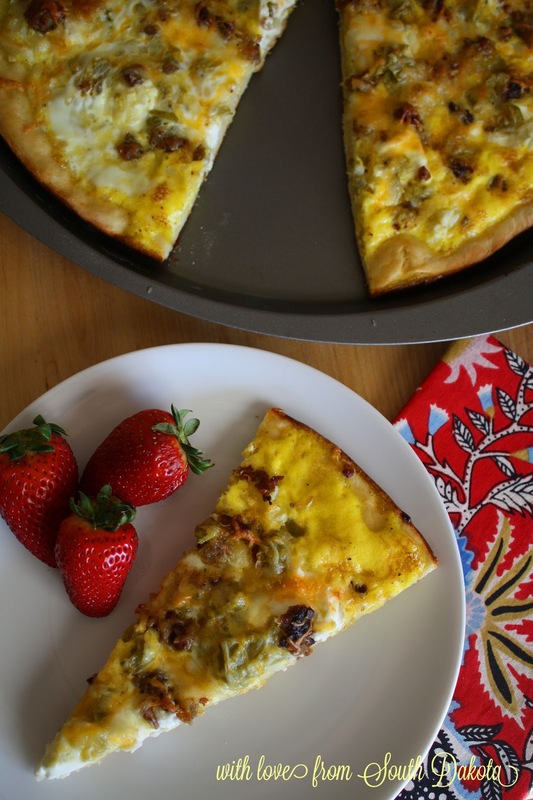 On a pizza pan or baking sheet, top the pizza dough with sausage. 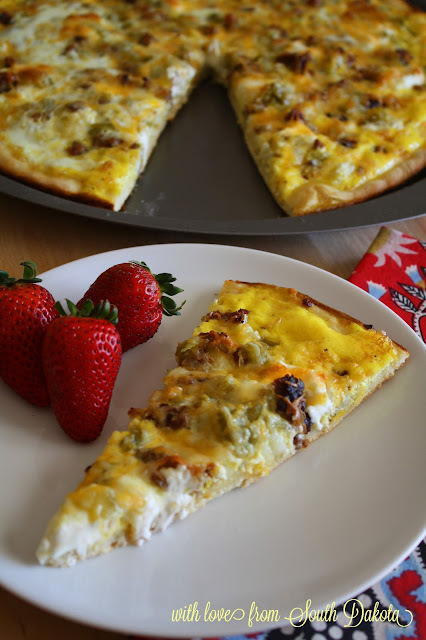 Sprinkle the dough with hash browns and green chiles. Place cream cheese cubes evenly over hash browns. 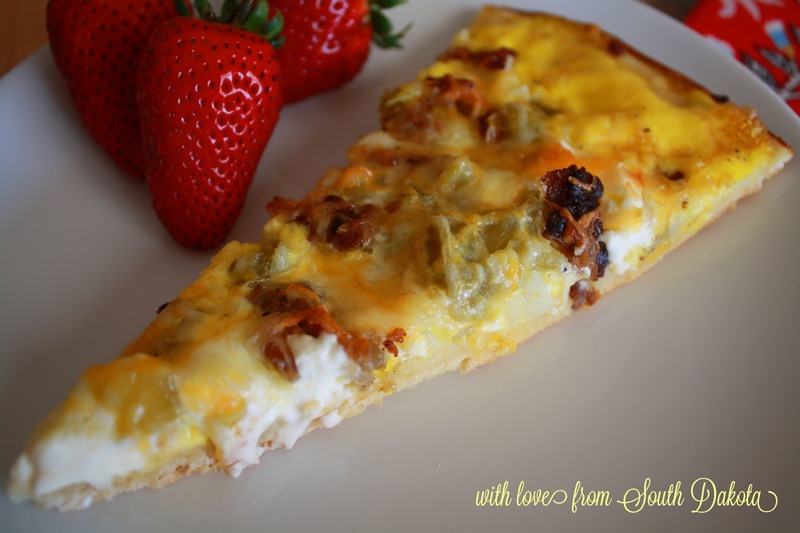 Top with the shredded cheese. In a medium bowl, beat together eggs, milk, salt and pepper. Pour over the pizza. Bake for 20 minutes or until cheese and eggs are browned on top. Makes one 12-14 inch pizza. I guess his reasoning for “washing” his face mid-afternoon and consequently soaking my bathroom counter AND his entire head of hair works for me, too. Did I just admit that? Yep, I totally brought this cheesecake tart because I wanted to. 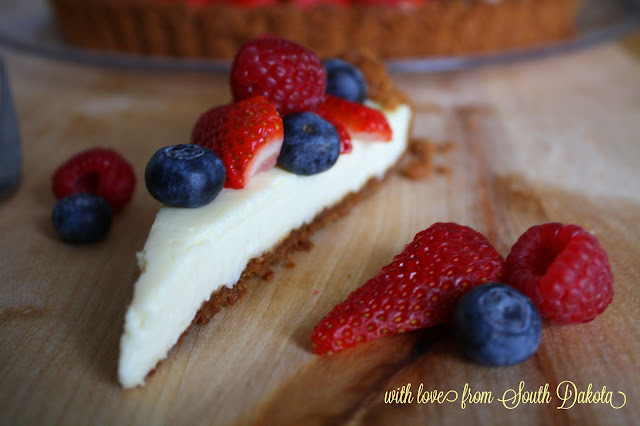 I’ve really wanted to make a cheesecake tart for some time. I thought my breakfast meeting would be the perfect opportunity. Who doesn’t love dessert for breakfast? I grew up having desserts for breakfast. Not all the time, but every time we had it in the house. It was (and still is) our way of life. A piece of birthday cake the morning after my big day? You bet. Chocolate chip cookies as soon as I wake up? Absolutely. A slice of pie with ice cream to get ready for the day? Game on. Desserts never last long in our house. Obvs. 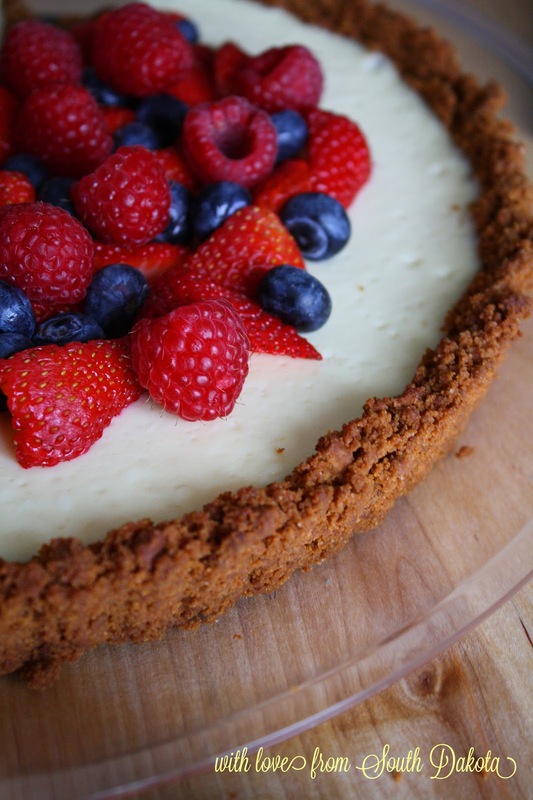 You see why it makes perfect sense to bring a cheesecake tart to a breakfast meeting, don’t you? I adore this Cheesecake Tart with a Biscoff Cookie Crust for so many reasons. The crust is completely and utterly amazing. 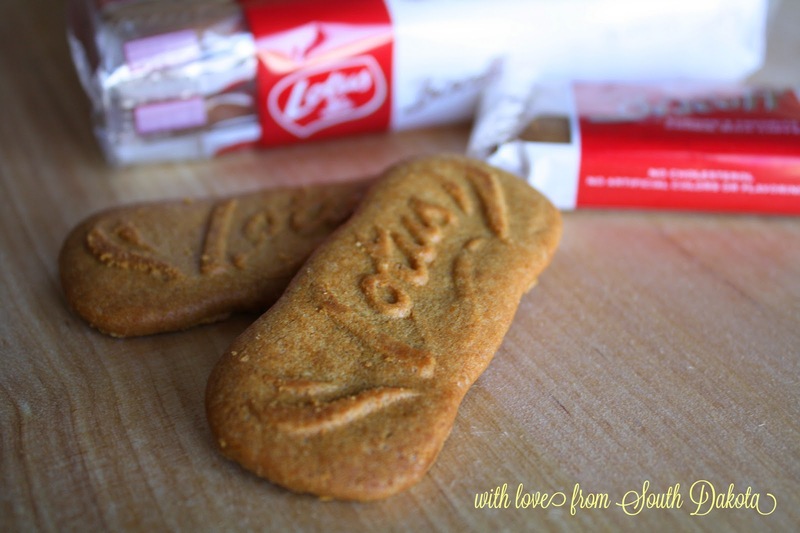 I do love me some Biscoff cookies, so it’s no wonder they make the perfect crust. And it’s so easy to make: cookie crumbs and butter, baby. The cheesecake comes together quite effortlessly. Its vanilla flavor compliments the cinnamon-y crust so nicely. 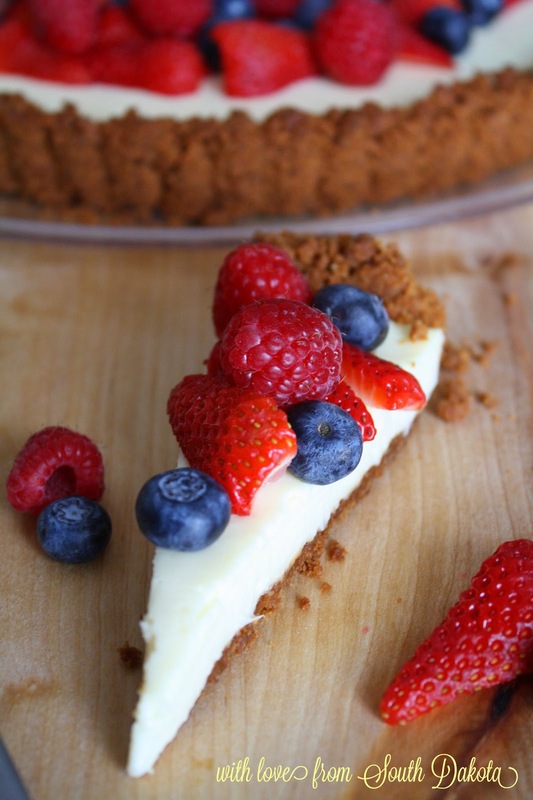 The crust and the cheesecake are truly a match made in heaven. The cheesecake ingredients are so simple, but the result is creamy fabulousness. Can you tell I love this tart? As for the topping—which is totally optional—I thought fresh berries would look so pretty. And they definitely do. I also determined the addition of fruit would make this sort of like a fruit pizza. A deep dish fruit pizza. 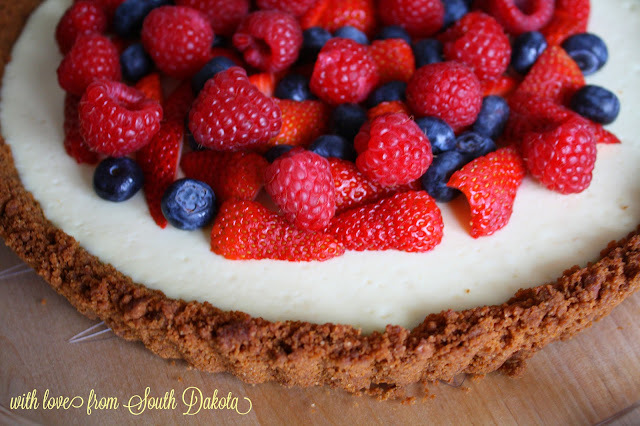 Well, the ladies in my mom’s group must agree with me that this cheesecake tart is totally meant for breakfast. The entire thing was gone. Every. last. berry. This is a simple dessert that exudes elegance. It would be perfect on a Mother’s Day brunch table or at a bridal shower. Oh, the possibilities! Preheat oven to 325F degrees. With cold butter, grease an 11-inch tart pan, making sure all of the crevices are greased. With a food processor, process the cookies until they reach a fine texture. Add the melted butter and pulse a few times to fully incorporate. Pat crumbs in the tart pan evenly. The flat bottom of a glass may be helpful to pat the crumbs. Bake for 10 minutes. Remove from oven being careful not to push up on the bottom of the tart pan. Let cool. In a medium bowl, combine the cream cheese, sour cream, eggs, sugar and vanilla. Using a hand mixer, beat the ingredients until well incorporated and smooth. Pour the cheesecake into the crust. Bake for 20 minutes or until the center only slightly jiggles. It will firm upon cooling. Remove from oven and cool completely before putting in the refrigerator to store. Top with fresh berries or any other desired topping. Serves 12-16. I'm Ashley, and I live in the Mount Rushmore State...by way of the Cornhusker State, the Hoosier State and the Sunflower State/Wheat State. I love food. From planning and preparing to plating and tasting to keeping or gifting, I am just having way too much fun in my kitchen! I'm a small-town girl who loves the deep blue sky of the Great Plains. Good steak gets me giddy, stinky cheese has my heart, and I think dessert is a must. Welcome to my South Dakota adventure!